The Bost Family: Weekend with Cookie!! We had such a fun weekend with Grandcookie, Jonathan's Mom! She arrived Thursday night and spent the entire weekend with us. Lucy really enjoyed spending time with her GrandCookie, they had not seen each other since Christmas. I also had a great time with Becky too! Sometimes it gets so lonely at home by myself so it was nice to have some company. Friday we all went shopping around town. We went to some specialty shops around town, which were all having sales. (final touch and signed sealed and delivered) We also bought a Thankful cake for Jonathan. Friday was a rough day for him so we thought we would cheer him up! Saturday we played at home. Lucy was awfully tired. That night Becky babysat so Jonathan and I could have a date night. We went out to eat and then to the movies to see Taken. Not a good movie if you are a new mom but it was a good movie. We were glad to get out. That was our third date since Lucy bear was born!! Sunday, we went to church. During church I let Lucy play with the bulletin. She started sucking on it and all the sudden we noticed that she sucked a corner off and it was in her mouth. I stuck my finger in but that just scared her and she swallowed it. So, yes I let my baby eat paper. It didn't seem to bother her. Lucy was great during the service, we didn't hear a peep out of her the entire time. The Coble's sat behind us and Lucy kept making eyes at her Uncle Ryan. 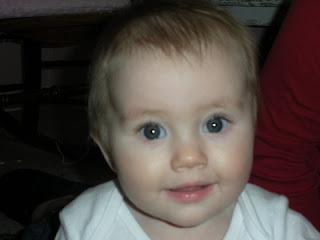 Uncle Ryan was making faces at her and she was making them right back!! They are so funny. After church we all went to Acambaros for lunch. Lucy slept through lunch which is not like her, she hates her car seat and she hates to sleep in it, really she only sleeps in her bed. So that has been our weekend. We can't wait for Cookie to come back up to visit and we are hoping Papaw will come next time too!! Here are some pictures from our weekend. Lucy in her Valentine's hat that GrandCookie gave her!! 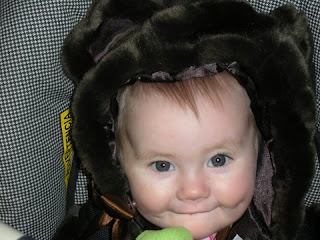 Lucy ready for church in her fur bear jacket! 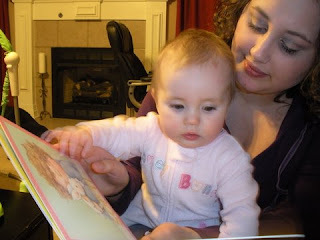 Lucy and Me reading a book. That picture of Jonathan and I needed to be small and blurry. We were both making a silly face! Papaw is thinking we might have to come back next week-end. He's jealous of all my Lucy stories. 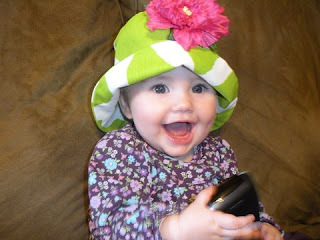 I love the hat...Miss Lucy is so cute! Ray was grumpy Friday...and most of the weekend. I know those guys are going to miss Marty. I know it is hard for them to tell us how they feel...they aren't as good at that as we are. ha! I hear they are all having lunch with him tomorrow. I asked Ray if we should send a card...he laughed at me. Sounds like you girls had a great weekend! I LOVE Lucy's new hat! I'm going to have to talk with Becky to see where she got it. I think Lila might need one!